UPDATE: Scroll down or click here to see updates as of 12am Oaxaca time on June 14. In the waning minutes of June 11, federal police, the federal gendarmarie, and state police carried out a violent raid against striking teachers blockading the Oaxaca State Institute of Public Education (IEEPO). 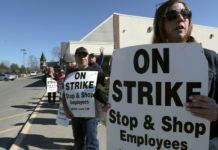 The attack comes almost ten years to the day when a similar state attack on striking teachers on June 14, 2006, led to a five-month, statewide rebellion. Teachers in Mexico have been on strike since May 15, demanding, among other things, an end to the neoliberal educational reforms being pushed forward by Mexican President Enrique Peña Nieto. For a roundup of events during the first 15 days of the strike, see the most recent Insumisión column. While things have been tense in Oaxaca, with Governor Gabino Cué announcing that he had hundreds of police ready to remove any teachers encampment or blockade, there have been no big confrontations until tonight. This is likely due to the fact that the state held elections on June 5 and did not want to take any action prior to that which might interfere. Then earlier on Saturday, federal police arrested Francisco Villalobos, the Organization Secretary of Section 22, the Oaxacan branch of the National Coordinating Body of Education Workers (CNTE). He is being charged with aggravated robbery for allegedly stealing free schoolbooks in 2015. In response, teachers set up blockades at major intersections throughout the city of Oaxaca and elsewhere in the state. Then came the raid on the teachers’ position at the IEEPO. At the same time, electricity was cut in the Zócalo, the city’s main square, where the teachers also have an encampment. In response, teachers and civil society began building barricades blocking off access to the Zócalo, communicating information using the union’s radio station, Radio Plantón. 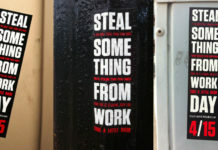 They also started toppling security cameras. Via Facebook, a compa from Oaxaca shared with me that “30 police trucks are headed to the Zócalo…On the edge of the city there are five buses full of riot police and more police trucks. The city center is under siege.” Another communicated that all up and down Independencia Ave there are shoes, belongings and trash scattered about, indicating that several people have been arrested. At around 2:30am Oaxaca time, it was announced that the Secretary General of Section 22, Rubén Núñez, was arrested on the border between Mexico City and the State of Mexico. The top two officials of Section 22 are now in state custody. 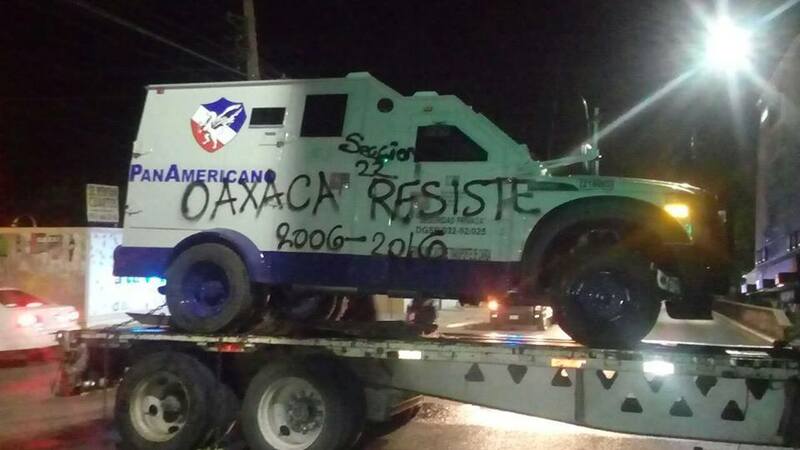 At the time of this writing, 3:30am in Oaxaca, Radio Plantón is reporting that military planes are now arriving in Oaxaca. They predict intense confrontations in the coming days. We will do our best to keep this page updated. Following the police repression on the night of June 11-12, many were wondering what daylight would bring on Sunday. A contact in Oaxaca reported that “Sunday AM all looked normal in the Zócalo” (the main square in the city center where barricades were built the night before). And indeed, while there were some marches and loud denunciations of the violence the night before, it seemed that Sunday became a day for both sides the regroup. 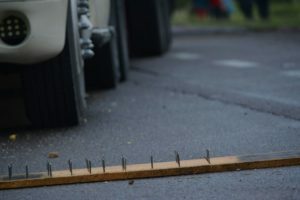 The police attack at the IEEPO, on the outskirts of the city, was likely a first foray to test the resistance that might be faced should federal forces attempt to enter the historic city center and remove the teachers’ encampment there. The teachers proved able to mobilize quickly, building barricades within 60-90 minutes at various points in the city, along with putting up resistance at the IEEPO. Monday, June 13: Highway blockades around the country and a rally in Mexico City. 8pm meeting at the CNTE national headquarters in Mexico City. 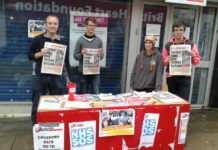 Tuesday, June 14: Leafleting and fundraising in squares and public markets. In Mexico City at 12pm a human chain in defense of public education, labor security, against state repression, and for negotiations. At 4pm a rally at the Antimonument to the 43 (from Ayotzinapa). Wednesday, June 15: Blockades and rallies at transnational companies. Friday, June 17: National Teachers-Peoples March in defense of public education at 4pm starting at the Angel of Independence in Mexico City. At 10am, visits to various foreign embassies. Saturday, June 18: Expanded Representative National Assembly at 10am at the CNTE national headquarters. Sunday, June 19: Larger joint meeting with urban and rural workers at 10am at the CNTE national headquarters. Also on Sunday, it was learned that the two union leaders arrested on Saturday are being held in a maximum security prison in Sonora, around 2,500 kilometers away and that 24 union leaders from Oaxaca have arrest warrants out against them. In response to the repression, a wide range of groups announced or reaffirmed their support of the teachers strike, including the 80,000 organized farmworkers from San Quintín in Baja California, the relatives of the disappeared students from Ayotzinapa in Guerrero, and the Peoples Front in Defense of the Land from Atenco in the State of Mexico. As well, students from the medical school at Oaxaca’s state university (UABJO) installed a free 24-hour medical post at the teachers encampment in the Zócalo. How did Monday go? 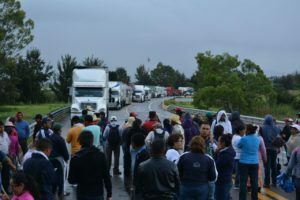 There were indeed highway blockades around the country and in particular in Oaxaca, where blockades were set up in the city of Oaxaca, Juchitán in the Isthmus of Tehuantepec, Pinotepa Naciónal, Puerto Escondido and Río Grande. Teachers allowed private vehicles to pass while detaining commercial and police traffic. The most significant highway blockade was in Nochixtlán, a few kilometers outside of the city of Oaxaca. There, teachers and residents prevented at least 600 federal police in 12 buses and 16 trucks from advancing on towards the city. 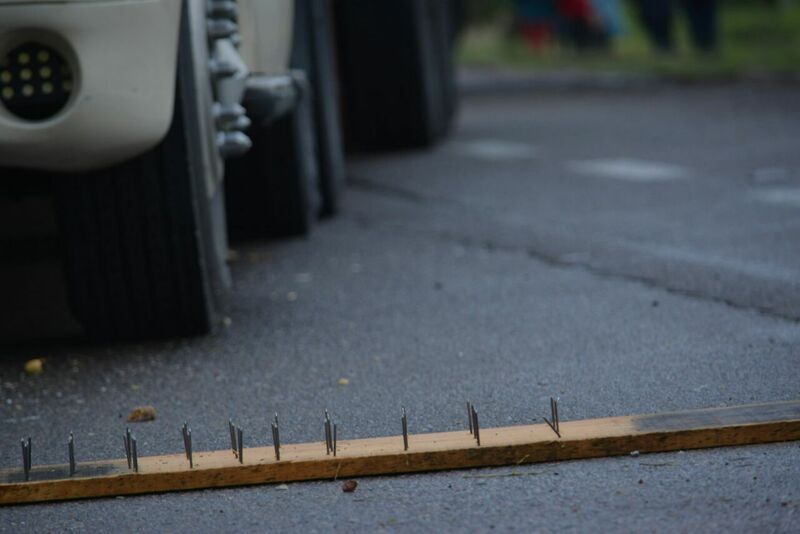 The police gave them 30 minutes to clear the blockade, but the blockade remained. Eventually, the police retreated 1.5 kilometers away, sensing they didn’t have the capacity to remove the blockade by force. The teachers and residents have announced they will maintain the blockade through the night. 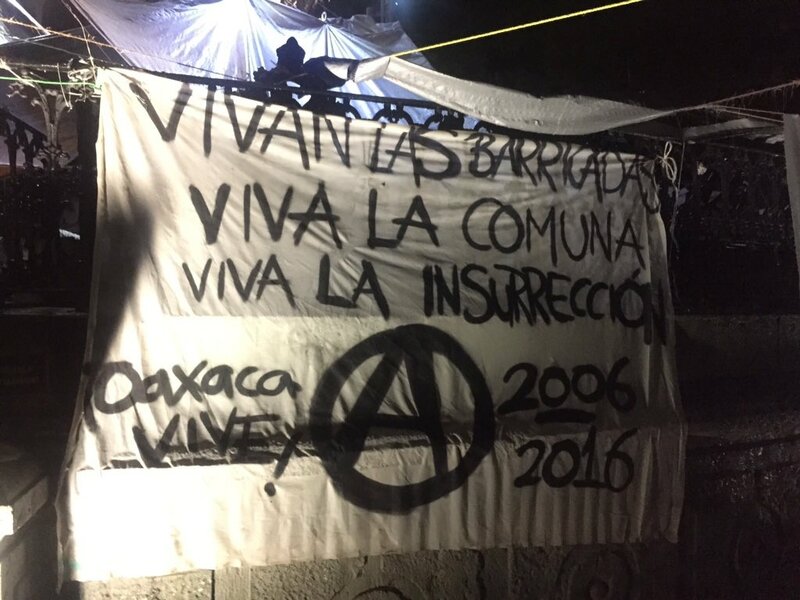 June 14, 2016, the ten year anniversary of a similar police attack that started a statewide rebellion and led to the creation of the Popular Assembly of the Peoples of Oaxaca (APPO), which ran the government and police out of the state and governed via assembly for five months. Along with the barricades tonight, Tuesday will see a mega-march, including a call for a black bloc.